Christopher Waddell is the program director for the Bachelor of Media Production and Design program. 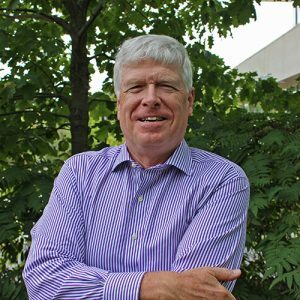 He is a professor at and former director of the School of Journalism and Communication at Carleton University in Ottawa and also holds the university’s Carty Chair in Business and Financial Journalism. He joined Carleton in July 2001 after 10 years at CBC Television News where he was initially senior program producer for The National and from 1993 to 2001, Parliamentary Bureau Chief in Ottawa and also Executive Producer News Specials for the network. Between 1984-91 he was at the Globe and Mail as a reporter in Report on Business, economics reporter in Ottawa covering among other things the Canada-US free trade negotiations, Ottawa bureau chief in the 1988 federal election and from 1989-91 he was associate editor and then national editor of the Globe. With David Taras of Mount Royal University in Calgary he is the editor of and a contributor to How Canadians Communicate IV: Media and Politics published in May 2012 and How Canadians Communicate V: Sports in 2016, both published by Athabasca University Press. They are currently working on a book for University of Toronto Press for 2019 that explores the role for the CBC as a public broadcaster in a post-broadcast world.